Many ask, "When do I fertilize my yard?" Fertilizing a yard is an important step in maintaining it and treating deficiencies. It can protect your grass from spring through summer and well into the fall, while also ensuring the grass has protection throughout the winter months. So, when should you fertilize? 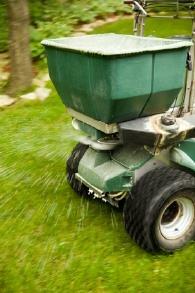 Fertilizing a yard is an important step in maintaining its health. Those who wish to keep their lawn looking its best need to focus on four specific things. First, consider your climate. Your grass type and the type of fertilizer you plan to use also matter. Finally, take into consideration what you want the yard to look like. Most will want to fertilize their lawn between four and five times per year. For those just hoping to maintain the yard, cut this down to just two or three times per year. Your climate makes a difference when it comes to when to fertilize. Fertilizing when the weather is too hot can lead to damage. There is no benefit to fertilizing during cold, non-growing seasons. When fertilizing, consider when your grass grows. If you live in the most southern states, where grass grows continuously throughout the year, fertilizing in November or December may be necessary. In areas where the grass does not grow until the spring, avoid fertilizing until the grass has greened up. In southwest states, where the temperature can be very dry, avoid fertilizing during dry spells. In climate zones 1 and 2, fertilize only when the grass is growing. Avoid treatments in the early spring. For zones 3 and 4, focus on fertilizing the grass during any season you would trim it. This ranges widely in this region because of elevation differences and temperature fluctuations. In zone 5, fertilizing every two to three months is advisable since grass is growing year round. In taking in the other elements, such as the way you want your yard to look and the types of fertilizers you use, standards that are more general apply. These tips will help you to determine when to fertilize. In terms of fertilizer types, many come in a combination. Some have time-release formulas that allow you to put the fertilizer down less frequently. It is often best to read packaging to learn how the product will work. Do not apply products with nitrogen in them if the lawn is dormant. In the spring months, wait until the grass is green before you apply fertilizer. When the temperature is dry, avoid fertilizing. The chemicals can burn the lawn, creating damage to it. Use weed and feed products during the spring and summer months. This helps to decrease the number of weeds heading into the fall season, which will improve the yard's health in the spring. If your climate is excessively rainy, you may need to apply fertilizers more often. To avoid this, use fertilizers when you do not expect several days of rain to occur. So, "when do I fertilize my yard?" you may be asking. For warm climates, plan to use a fertilizer and pre-emergence product (15-15-10) during the early spring, but only if the grass is green. Most will start the season with a fertilizer and weed control product in April or May. An application of fertilizer again in June is the recommendation. Follow this with a pest control product during the July to August window. For fall, apply a fertilizer product during September or October, once the temperatures come down. It is also important to know your lawn. If your lawn looks like it needs help, such as having a pest problem or being overrun with weeds, an application of the right lawn fertilizer can help to reduce this problem. Focus on purchasing quality products that last for the best results without a high cost.